In recent studies, Traditionalists (born 1920’s – 1940’s) and Baby Boomers (born 1940’s – 1960’s) are remaining active later in their careers due to a number of factors including the unpredictable economy, student loans, and overall high cost of living. Gen X (born 1960’s – 1980’s) are at the height of their careers and are learning and growing through mentorship, while Millennials (1980’s – 2000’s) have introduced new ways to think about technology and have brought a renewed passion to learn and grow, take more risks. On the other end of the spectrum is the opposite — a diverse group of digital natives, out-of-the-box thinkers, and fearless entrepreneurs leading the way to the next generation of business ideas – Gen Z. Gen Z has been raised in a unpredictable world, born just before or during 2007’s financial crisis and into a mess of global issues, making them one of the most open and adaptable generations yet. So how have businesses come to adjust for this change in their company culture? By adapting their communications to flow seamlessly with the next generation: Gen Z. Every generation in your company is equally important. It’s just as important to view your employees as more than just their age or generational stereotype – they’re individuals who come from a variety of backgrounds, skills and experiences. Continually adapting the flow of your internal communications is part of the foundation that will propel your businesses forward. It allows for more opportunities to discover the best innovative solutions for your clients while simultaneously creating a better customer experience. 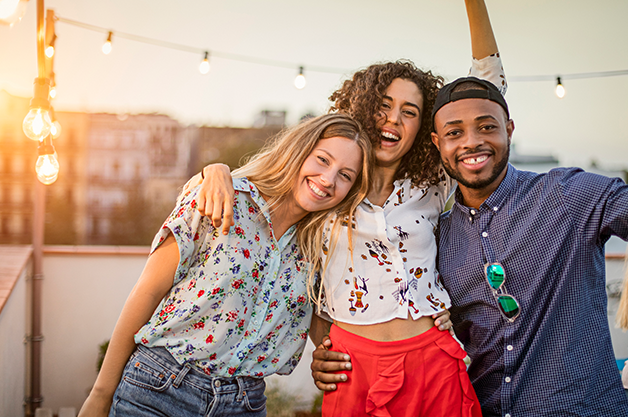 The ultimate strategy for optimizing your internal communications for Gen Z involves a collaboration between the knowledge and experience of older generations with the “can-do” attitude and youthful spirit of young professionals. Education is a two-way street. 1. Demonstrate loyalty and value for authenticity. In today’s work culture, younger workers seek more authentic interactions. High-frequency advertising and constant exposure to marketing have made them distrust many brands and businesses. To benefit the most from what Gen Z workers have to offer, your employees should maintain an open-door policy when appropriate. When employees share their successes, struggles, and failures, it fosters a more genuine connection between departments and across generation lines. 2. Create everyday teaching moments. According to the Harvard Business Review, “studies show that colleagues learn more from each other than they do from formal training, which is why it is so important to establish a culture of coaching across age groups.” Gen Z-ers seek out frequent coaching and feedback, just as Millennials do. They will possess even more entrepreneurial qualities, creating a deep desire to continually improve and learn. Providing access to capable mentors, while providing them regular feedback, will encourage more frequent communication. It will also help more experienced employees develop their leadership skills. Regularly surveying Gen Z-ers will do the same. Having a central hub for all internal communications is crucial for this reason – it’s a quick and efficient medium that Gen Z is already comfortable with and you’ll be able to gain input and feedback seamlessly. At times, there may be instances of employee frustration in regards to cross-generational relationships in the workplace. Many companies end up having younger employees managing older workers. Help your team move beyond generational labels by creating opportunities for all employees to converse freely with fewer reservations. Encourage debate on your internal platform by starting discussion threads or posts team members can participate in regularly. Create information exchanges by encouraging younger employees to ask questions and help ideate with more experienced employees. Typically, young employees just starting their careers don’t have an overwhelming amount of outside obligations. Again, this varies from person to person, but Gen Z will be motivated to seek out new experiences and opportunities, which necessitates flexible work hours. Allowing all employees, including Gen Z, to focus on work while prioritizing other aspects of their lives like family, school, volunteering and personal passions allow for effective, valuable communication. Using an internal hub, for this reason, enables this flexibility by keeping everyone informed of company news, projects and updates. The first step in generating business and driving growth is building the foundation of your company’s internal communication strategy. Understanding the demographics of all generations employed by your organization will improve your internal/external engagement. You will gain the ability to attract new talent, stay relevant and grow your business, while your employees will be inspired and passionate about the work they do and spread your ideas and messaging.